Endorsement check deposit stamps. 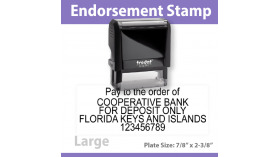 Check Endorsement Stamp "For deposit only" stamps to endorse your checks. 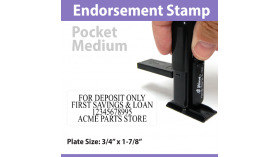 Do you need a stamp to endorse your checks? 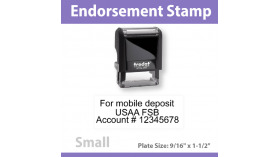 Use your self-inking check endorsement stamp, to speed up the deposit preparation process. It prevents against deposits to the wrong account by mistake. Safeguard your money. 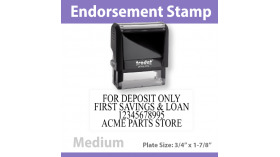 If your business receives several checks as payment, this stamp can simplify your administrative tasks. When properly endorsed, with the correct account number, you make sure your checks will not be erroneously deposited to other accounts. 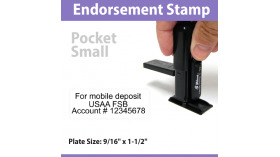 Handy Stamp S-722 Small POCKET Check Endorsement Self Inking Stamp up to 3 lines of text. 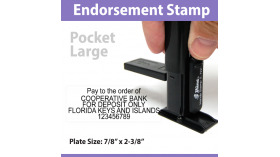 Handy Stamp S-723 Medium POCKET Check Endorsement Self Inking Stamp up to 3 lines of text.